A spider bite treatment may or may not be necessary depending on which type of spider did the biting. Most spiders do not cause significant problems for the skin of humans and their overall health. However, some spiders are a lot more dangerous and can cause significant problems if proper treatment is not administered. Effective spider bite treatment usually depends on identifying the type of spider that did the biting. Therefore, if possible, the offending spider should be caught and brought with you when seeking medical attention. There are some general spider bite treatment procedures which should be followed when a bite occurs. For example, it is important to keep the victim motionless and calm as much as possible to prevent the venom from spreading and spreading quickly. If the arm or leg is bitten, it should be elevated to help prevent swelling. Wash the wound with soap and water to prevent infection or use an antibiotic cream or lotion. Apply a cool wet and clean cloth to the area and intermittently apply ice to the affected area. Do not cut the wound. A painkiller such as acetaminophen can be used. Non-steroidal anti-inflammatory drugs can also be used to control the swelling and pain. Antihistamines are a useful spider bite treatment because they are effective in combating itch and swelling. Do not use a tourniquet because this may aggravate the local effect of the bite. Do not use snakebite venom on spider bites. Eating, drinking, and smoking should be avoided. Finally, an important spider bite treatment procedure is to call for medical assistance, especially if it is suspected that the biting spider is dangerous or if the victim is showing some of the more serious spider bite symptoms. In addition to the general spider bite treatments, there are also more specific spider bite treatment procedures for different spiders. In particular, the focus is on some of the more common dangerous spiders. Widow type spiders are found throughout the world. In North America, they are known as Black Widow, in South Africa as shoe-button spiders, in New Zealand as Katipo, in Australia as Red-Back spiders, and in Europe as Malmignatte or Karakurt. These spiders are long-legged and have a shiny coal-like or inky-black color with an hourglass looking shape on the underside of the belly. The hourglass can be orange, red, or yellow in color. The abdomen is large and round. The average size is about 25 mm, but size may go up to 50 mm with the legs included. These spiders are non-aggressive and only bite to defend themselves. Usually this occurs when webs are disturbed or when the spider is trapped against the skin such as in clothing. Only the female is poisonous. Widow spiders prefer warm climates and are found in old wood stumps or woodpiles, trash, closets, attics, garages, other dark places. A bite from a widow spider feels like a pinprick at first or a sharp like pain. Two red fang marks may be visible surrounded by a pale area and then redness. This gives the appearance of a target-like mark. This is followed by swelling, burning, and an overall redness of the skin around the bite area. These symptoms may last 3 to 5 days if left untreated. In more severe cases, because the venom is neurotoxic, the neurotoxic symptoms will develop in 30 to 180 minutes. Symptoms such as severe muscle pain and cramps mostly affect the back, shoulders, abdomen, and thighs. Also, fever, chills and sweating, weakness, skin rash and itching, slurred speech, headache, nausea and vomiting, seizures, high blood pressure, difficulty breathing, eyelid swelling, and anxiety can occur. A spider bite treatment for a widow spider bite that is not serious involves following the general suggestions mentioned above. For more serious bites, the best spider bite treatment is to seek medication attention as soon as possible, especially if the individual is very young or elderly. Anti-venom is available to deal with widow spider bites. In addition, stronger medication for pain can be prescribed such as Demerol as well as medication for muscles spasms such as Valium. High blood pressure can be treated with anti-hypertension medications. will usually only bite for defensive purposes such as when trapped or held against the skin in clothing, etc. A bite from a recluse spider may require no more than the general spider bite treatment. There may be some localized swelling and redness, but healing can occur without much intervention. However, in some cases the symptoms and skin and health problems can become quite serious. The recluse spider has cytotoxic venom. A bite from a recluse spider causes the skin to become red and then a blister forms at the site of the bite. A burning pain from mild to intense and itching starts anywhere from two to eight hours after the bite. The wound has a target like appearance. The blister is in the center and a red ring surrounds it. Outside of this red ring is a pale white ring. As described above, deep skin ulcers and necrotic tissue can develop with cytotoxic venom. Usually by 12 to 24 hours, the victim knows if the more serious symptoms will develop and a more thorough spider bite treatment would be necessary at this point. A deep blue or purple area around the bite will form if the tissue is becoming necrotic. Dapsone is occasionally used to prevent dead tissue from occurring and the open sore from becoming worse. If the necrotic symptoms are not present by two to four days then they will not occur. If a bite victim has any sign of a necrotic lesion, then medical attention should be sought after immediately. Some individuals have full body reactions to this type of spider bite. These spider bite symptoms include fever and chills, skin rash all over the body consisting of numerous small flat purple and red spots, nausea and vomiting, joint pain, and rapid destruction of red blood cells and anemia within 72 hours. In this case, medical attention is required. There are various skin conditions and skin problems that can mimic a recluse spider bite. Conditions such as bedsores, diabetic ulcers, infected herpes outbreaks, allergic reactions to poison oak, or Lyme disease may all be sometimes mistaken as a recluse spider bite. The Hobo spider is common in Europe and western central Asia. In can also be found in British Columbia and Yukon (Canada) and in several states in the United States such as Utah, Montana, Washington, Idaho, Oregon, and Alaska. The spider is light brown in color and has a yellowish green tint on the abdomen section. Its body length is 7 to 14 mm or about one-half inch maximum. It builds funnel webs in wood, rock, or debris piles. Unlike many other spiders, this one is more aggressive and may bite a human with little provocation. Once bitten the skin becomes red within a few minutes. There is likely to be numbness and tingling around the bite. A blister will form within 36 hours of the bite because the venom is cytotoxic. Like the recluse spider bite, once the blister breaks there is an open slow healing wound that may become necrotic. The wound is generally less severe than the recluse spider bite wound. 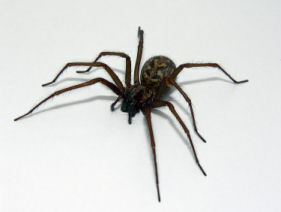 Spider bite treatment is standard unless a complication such as the wound becoming necrotic occurs, and at that point, medical attention is required. Other symptoms are headaches that can last up to one week, weakness, drowsiness, and distorted vision and hallucinations. 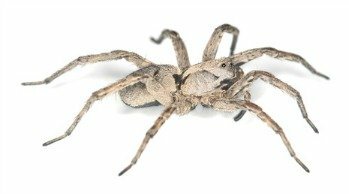 Wolf spiders are found throughout Australia and in the United States. They can be three to four inches in size and are hairy. They have a mottled grayish brown color. They like to hide in sand, gravel, leaves, and other debris piles. A bite causes pain, redness, and swelling as is the case with other spider bites. Tearing of the skin may occur because of the large fangs that this spider possesses. The venom is mildly cytotoxic. The skin at the bite area may turn black, which is a sign of dead tissue. The swelling and pain can last for up to ten days. Follow basic spider bite treatments or seek medical attention if the bite area turns black or more severe spider bite symptoms develop. The yellow sac spider is found in the United States and there are around 100 species worldwide. The spider is pale yellow in color and has a body length of 6 to 10 mm. Bites are painful and become red, swollen, and itchy. The venom is cytotoxic. A slightly necrotic wound or ulcer may develop, but often heals without scarring or minimal scarring. This necrotic wound is much less significant than for the recluse spider. Follow the typical spider bite treatment protocol and as with other bites consult with a physician if unusual symptoms appear or if you are concerned. This spider is well known for striking fear into individuals. It is a large hairy spider. The hairs are like sharp bristles. These bristles contain a toxin that can cause a significant skin rash and allergic reaction. The hairs pierce the skin and produce itchy bumps on the skin that can last for weeks. Even just handling a tarantula can irritate the skin. In addition, this spider will release these sharp hairs when bothered and these hairs will irritate the eyes and nasal passages. This can be quite painful and uncomfortable and will likely required medical attention for treatment. If tarantulas are touched, it is a good idea to wash the hands in order to avoid skin irritation. 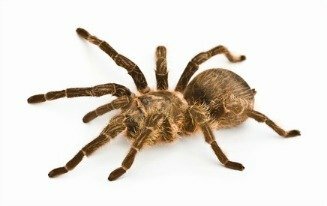 A spider bite treatment is not usually required for tarantula spiders because they rarely bite. If they do, the bite generally does not produce significant poisoning symptoms. Some swelling will occur and there may be quite a bit of pain, simply because of the size of the spider. Follow the standard spider bite treatment procedures after receiving the bite and monitor the skin and health of the individual for signs of more serious complications. 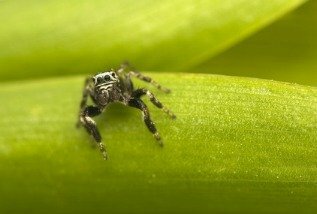 The jumping spider is the most common biting spider in the United States. If a bit occurs, it is painful, itchy, the site becomes red, and there is usually significant swelling. Symptoms that are more serious include painful muscles and joints, headaches, fever, chills, nausea and vomiting which may last from 1 to 4 days. Follow basic spider bite treatment procedures for less serious bites and seek medical attention for ones that are more serious.